John Charles Earl, later known as Charles, was born in 1886 at East Anstey, Devon, the son and eldest child of coachman and groom John Earl (b1863) and Elizabeth Ann née Roberts (b1864). In the 1891 census John and Elizabeth, together with their three children: John, Florence (b1889) and Frederick (b1890), were listed at Waddicombe, East Anstey. By the time of the 1901 census 14-year old John was living with his uncle William Roberts, a grocer and shopkeeper of High Street, Dulverton, Somerset. John was a grocer's apprentice. 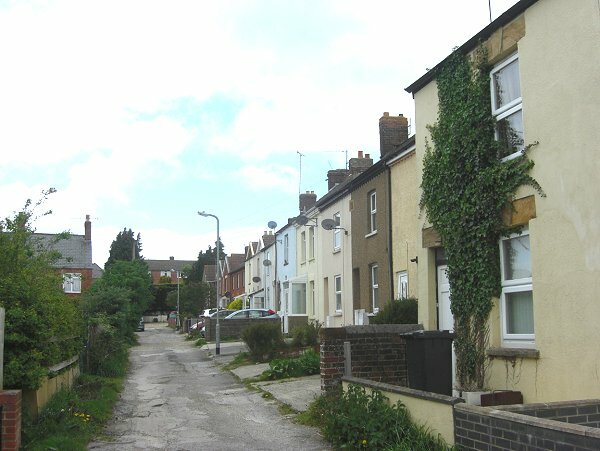 During the next decade John, by this time known as Charles, had moved to Yeovil and was living with the family of cheese manager John Wallis at 16 North Terrace, Newtown. 25-year old Charles worked as an assistant grocer. Charles fell in love with John Wallis' daughter, Henrietta Matilda (b1886, Yeovil), a teacher, and they married during the summer of 1914. They lived with Henrietta's parents in North Terrace. Charles initially enlisted in the North Somerset Yeomanry, Service Number 2538, at Yeovil, but was soon transferred to the 1st Battalion, Duke of Cornwall's Light Infantry with the new Service Number 32020, probably during the early summer of 1917. This battalion had been raised in September 1914 and came under command of 61st Brigade in 20th (Light) Division. It landed at Boulogne on 25 July 1915. Charles was sent to the front during early October 1917 and was almost immediately engaged in the Second Battle of Passchendaele (26 October – 10 November 1917), a phase of the Third Battle of Ypres. The battle took place in the Ypres Salient area of the Western Front, in and around the Belgian town of Passchendaele. Charles was reported wounded and missing on 6 November 1917. Although it took nearly a year to confirm his death, it was later confirmed as this date. He was 32 years old. In its edition of 30 November 1917 the Western Gazette reported "Mrs Earl of 16 North Terrace, Newtown, has received a letter from a Wesleyan chaplain in France, stating that her husband Lance-Corporal C Earl, has been wounded and missing since November 6th but no official news to this effect has been received from the Record Office, although letters sent to him have been returned marked “Wounded: allocation uncertain.” He was with the Duke of Cornwall’s Light Infantry, and had only been in France about four weeks." This news was eventually followed up in the Western Gazette on 11 October 1918 when it was reported "Mrs HM Earl, of 16 North Terrace, Newtown, on Sunday received an official notification from the War Office stating that no further news could be found regarding her husband Lance-Corporal JC Earl, D.C.L.I., it was previously reported that he was killed on November 6th 1917 or since that date. The deceased was previously reported wounded and missing." 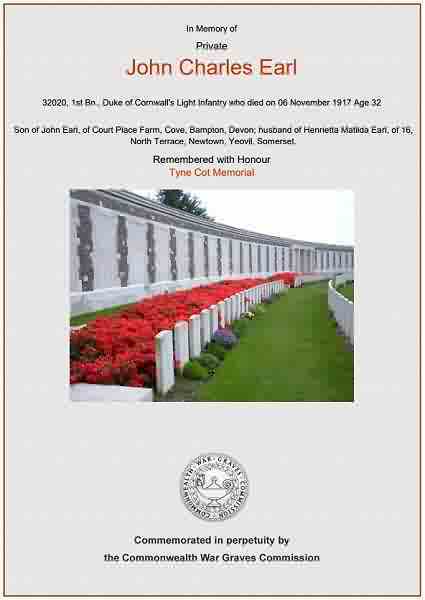 John Charles Earl is commemorated on the Tyne Cot Memorial, Panel 80 to 82 and 163A, and his name is inscribed on the War Memorial in the Borough. North Terrace seen from Grass Royal. Photographed in 2013. The Wallis family lived here and when Charles married Henrietta Wallis, they too lived here. The Commonwealth War Graves Commission certificate in memory of John Charles Earl.